Even though I am definitely a woman, Google has me pegged as a man. That’s what I learned today. 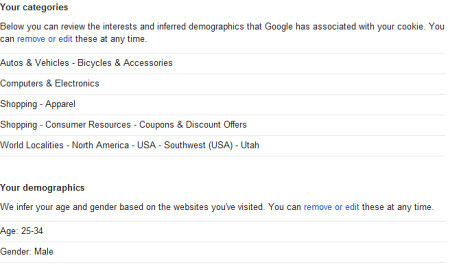 Apparently I’ve confused the giant search engine because under my Google settings, in a tab called Ads Preferences, it determined how old I am and my gender based on my search preferences. I think Google is just sexist, defining men or women by search categories. However, if you look at the list, that doesn’t exactly scream MALE to me. What do you think? Two of those are shopping. That says male to Google? I guess they’re thrown by the first two categories: bikes and computers/electronics. I wonder if I spent an afternoon searching for certain categories how it would rate me. Not one entry for cat searches. So surprising~! So how old does Google think YOU are and did it pick the right gender? Can You Flush a Toilet Handle? DOC: Oh good. You’re here. LRE: Um, yeah. Glad you seem excited about that. DOC: Yeah, I came prepared. LRE: You come unprepared normally? DOC: Uh… maybe. No. Yes. Whatever. DOC: Let’s put it this way: I came EXTRA prepared today. DOC: I looked up questions on Google. LRE: Oh good. My therapist is really Google. DOC: Ha. I mean. No, come on. They’re good questions and they just ADD to my already deep repertoire. LRE: I bet. What are your googled questions? DOC: Okay, let’s start with this one: Do you worry what you choose to eat will cause you to get cancer? LRE: What? Are you kidding me? DOC: Is this the face of somebody who’s kidding? LRE: You don’t have a face; you’re imaginary. DOC: Fine. Is this the IMAGINARY face of somebody who’s just pulling your leg? LRE: What’s the next question? LRE: No. It’s a stupid question. Try another. DOC: What do you picture when you pray? Do you have a picture for God? LRE: Therapy is now a religious discussion? DOC: Why are you answering my questions with a question? I thought that was MY tactic. LRE: Apparently, I’m the better therapist here. DOC: Yeah, right. Who’s got the list of questions? LRE: You do, big guy. What’s the next one? DOC: Do you have a friend who is not really your friend? DOC: STOP THAT. Come on. Just answer the question. LRE: I don’t like your questions. Or perhaps I should say, I don’t like GOOGLE’S questions. Try another. DOC: This is my imaginary FRUSTRATED face. LRE: It’s a good one. DOC: Do you think your parents wanted you? Do you think they ever regretted you were born? LRE: What kind of site did you get these from? DOC: This one… “Questions My Therapist Should Ask Me.” It made it sound like I was going to turn you into an Einstein by asking “provoking” questions. Apparently, you’re better than Einstein because you think you’re TOO GOOD to answer my questions. LRE: Pretty much. Let me see that website… hmm… most of these questions seem to be trying to provoke anger, doubt, fear. You should have picked a more upbeat site. Guess you did succeed… they are PROVOKING questions. Nice work, Doc. DOC: That’s the last time I ask Google how to do my job. Somebody already owns all of the good domain names. I wanted to have a blog at www.misfittoy.com, but it wasn’t for sale. (But it sure is being put to good use by its current owners.) The same company that owns that site also bought up misfittoys.com. Good thing.